It's Week 11 of Major League Rugby and it looks like we're down to six teams fighting it out for the four playoff spots. Houston, Utah, and Austin are bringing up the rear of the league. While San Diego and Toronto are currently on the outside looking in. If the playoffs were to start this week, Seattle would be facing NOLA and Glendale would be facing RUNY. Some might feel sorry for the Warriors this week. Coming off a blowout loss against the Toronto Arrows, they now will face the defending champion Seattle Seawolves, who will be disappointed to have only walked away with two bonus points against the San Diego Legion last week. Seattle had a two man advantage at times and couldn't take advantage. The Warriors seem to have gotten off track from last season. Last season they were middle of the pack and this season they are back of the pack. The talent seems to be there, the Warriors just can't put it together on the field. The Warriors gave the Seawolves a fight last season, but Utah is a different team this year. The scoreboard wasn't kind to Utah last week and while it will look better this week, the Warriors will still be on the wrong side of it. Seattle will get a boost to their forward pack as Djustive Sears-Duru finally joins up. 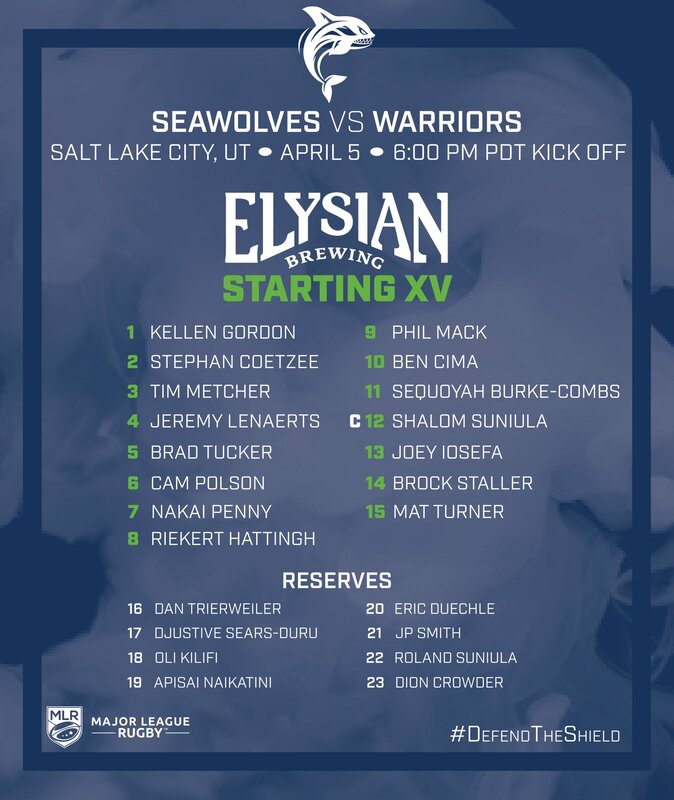 The Seawolves will look to use the added strength to their forward pack to take out their frustrations on the Warriors. One good thing for the Warriors this week will be the possible increase in attendance. With the AAF shutting down, Utah is offering complementary tickets to the Salt Lake Stallions fans. Fans can use the promo code "Stallions" to claim up to four free tickets here. The Houston SaberCats, unless something crazy happens, are most likely going to miss the playoffs. They are pretty much playing for pride at this point. However, Houston does have momentum coming into this matchup against the Glendale Raptors. In their last match, the SaberCats earned their first victory over a non-Austin Elite team with a 29-27 victory over the Utah Warriors. Just because the SaberCats are a struggling squad, does not mean the Raptors can take them lightly. Any squad can win on any given night. Glendale must keep their foot on the gas. Feed the beast on the wing, John Ryberg. Ryberg has been nothing but a wrecking ball on the pitch. Teams have a hard time containing him and he is a big part of why the Raptors average close to 1000 meters gained per match. The matchup to watch here will be the forward packs. Houston has one of the top packs in Major League Rugby. Glendale has an average to bottom of the table pack. It's serviceable, but could be a lot better. Houston needs to push the Raptors around the park and Glendale needs to play quick ball in the scrums. Look for Glendale to play fast and wide, while Houston tries to slow it down and play through their forwards. Another matchup of two teams coming from two different previous week scenarios. NOLA is coming off a heart breaking loss to Glendale, where they couldn't hang onto the ball in the last few minutes of the match and then gave up a chip shot penalty to the Raptors. The momentum swung wildly in that match and it looked like the Gold had it last, but momentum is a fickle beast and it just wasn't NOLA's day. Meanwhile, the Toronto Arrows are coming off a record setting, nine try performance against the Utah Warriors. That match set the records for most combined points and most points scored by one team in Major League Rugby history. Each of those nine trys was scored by a different player, with the forwards scoring five trys and the backs scoring four. This will be a big match for Toronto for two reasons. One, it will be a revenge game for the Arrows. In week one, the Arrows almost completed the comeback against NOLA, but they ran out of time. Two, it's all home game for Toronto from here on out. The Arrows no longer have to worry about the hassle of crossing the US border. The Gold will be looking to get back on track as they could've been coming into this match on a two match losing streak. It took a last minute try against Austin to prevent that. This will be a tight matchup between these two squads. Expect nothing but hard, physical play from whistle to whistle. This will be a very different matchup from week four of this season. The Legion have dropped off a little, while Austin has started to put things together. They aren't there yet, but don't be surprised if they pull off the upset some time soon. The Legion are coming off a strong performance, with a depleted squad, against the Seawolves. Austin is coming off of one of their best performances to date in MLR against RUNY. The Last time these two teams met, San Diego won in a blowout 45-17. The score will be a lot closer than that this time around. Austin's forward pack has really improved and caused RUNY some problems at points last week. San Diego has one of, if not, the best forward packs in MLR. So Austin won't run away with this, but they will be able to cause the Legion fits at times. The backs are an interesting matchup here. Now that Austin's visa issues, for the most part, have been solved, they are really showing what they were missing at the beginning of the season. Rodrigo Silva, Andrés Vilaseca, and JP Aguirre have given Austin some renewed confidence. Joe Pietersen is the MVP of the 2019 season so far, and he has a decent supporting cast around him. This match will be won or lost based on what happens here. Another casualty of the AAF shutdown was the San Diego Fleet. After the Chargers moved to LA, San Diego really missed football and this was another knife in the heart. But the Legion have come up with an offer for those with tickets to the Fleet's April 14th game. The Legion will honor any ticket from that game at any of their remaining home matches.